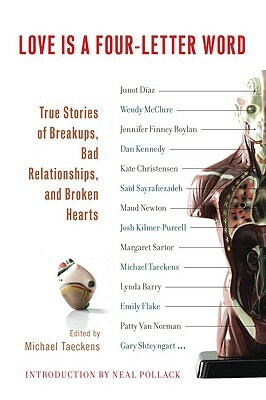 From Junot Díaz, Lynda Barry, Gary Shteyngart, and Kate Christensen to popular up-and-comers like Dan Kennedy, Wendy McClure, and Brock Clarke, Love Is a Four-Letter Word is a dead-on contemporary collection of true stories of seduction, heartbreak, and regret. Fearlessly revealing their shattered hearts and crushed egos; their indiscretions and indignities; their delusions, desperation, and disappointments, these talented writers capture the dark side of love in prose ranging from comic to poetic, poignant to cringe-inducing. Also featuring three cartoon/ graphic essays as a sixteen-page color insert, this anthology is perfect for anyone who’s ever loved and lost.